Saint Mark Catholic Academy is governed by a two-tiered board that is comprised of a Board of Directors and a Board of Members. The Board of Members is comprised of pastors aligned to the academy, the bishop, and the superintendent. Together, they function as prime sponsors of the academy. They appoint the Directors and ensure the overall Catholic identity of the academy and its programs. 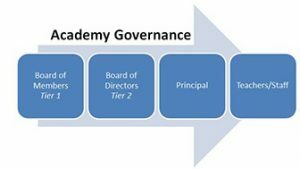 The Board of Directors is composed of lay people who function as the governing body of the academy. They select the principal and serve as immediate supervising body. They are passionate about Catholic education and share their expertise in areas of: finance, facilities management, institutional advancement, marketing and public relations. Edward Antonio, Saint Mark Catholic Academy Board Secretary. Saint Mark parishioner for over 25 years. Received all sacraments at Saint Mark, including marriage. Attended Pace University, majored in Business Administration, class of 1962. Attended Brooklyn College Graduate School of Health Administration. Retired Sales Director, pharmaceutical/biotechnology industry. Current parishioner at St Thomas Aquinas, Flatlands. Two adult children, six grandchildren. Frank Danza, Saint Mark Catholic Academy Treasurer; Member of the Finance and Development Subcommittee. Saint Mark parishioner for fifty years. Attended Saint Mark School, class of ‘76. Graduated New York University with a Bachelor of Arts, accounting, class of ‘84. Currently a licensed Certified Public Accountant and Senior Vice President of Finance at Northwell Health, headquartered in Great Neck, Long Island. Married with two adult daughters. Sara J Gozo, Esq., Chair of Saint Mark Catholic Academy, and Trustee of Saint Mark Parish. Co- Chair of the Strategic Planning Committee of Saint Mark Catholic Academy, Member of the Finance Committee of St. Mark Parish. Lector and Minister of Holy Communion- Saint Mark Parish. Graduate of New York University Washington Square College of Arts and Sciences and New York University School of Law. Sole partner of the Law Offices of Sara J Gozo, Esq. Lady Commander, with Star, of the Equestrian Order of the Holy Sepulchre, Columbiette of the Knights of Columbus, President of the Kings County Chapter of the Catholic Lawyers Guild 2009-2013. President of the Kings County Chapter of the Women’s Bar of the State of New York, 2016-2017. Chair of the Memorabilia Committee in conjunction with the 150th Anniversary of St. Mark Parish, author of “The History of Saint Mark Parish”. Family has been in the parish for 90 years. Joseph Marino, PhD, Saint Mark Catholic Academy Membership Chair. Attended Catholic elementary school at Saint Catherine of Genoa in Brooklyn, Saint John’s Preparatory High School in Brooklyn and Saint Francis College, Brooklyn Heights. Earned an M.A. degree in Philosophy from Queens College and an M.S. degree in Educational Administration from Fordham University. Attended the City University of New York Graduate Center earning a Ph.D in Philosophy. Virtually all of my professional life spent in Catholic education as a teacher, school administrator, and high school principal. Currently an adjunct professor of Philosophy at Saint Francis College, Molloy College, and Hofstra University. Richard Redling, Saint Mark Catholic Academy Vice Chairperson, lifelong parishioner of Saint Mark Church. Attended Saint Mark School, class of 1969, Brooklyn Technical H.S., class of 1973. Graduated from Brooklyn College with BA in History 1978. Post graduate studies in Marine Transportation at SUNY Maritime College, Bronx NY. Purchasing Manager in the maritime industry for 40 years. Currently Purchasing Manager for New York Cruise Lines, New York, NY. Joanne Romano, Saint Mark Catholic Academy Finance Committee. Attended American Institute of Banking, has 45 years of banking experience. Currently Vice President at the Sheepshead Bay Branch of Popular Bank. Anthony Russo, Saint Mark Catholic Academy Development Committee. Graduate of Saint Mark School, class of 1979. Attended Xaverian High School, graduated class of 1983. Currently managing partner Gargiulo’s Italian Restaurant, Coney Island. Michael Starace, Saint Mark Catholic Academy Marketing Committee. Graduate of Saint Mark School, class of 1971. Retired from FDNY 1981-2002. Has been in the Restaurant Industry since 1979. Michael has three children and two grandchildren. Richard Stockley, Saint Mark Catholic Academy/Saint Mark Church Facilities Manager. Born in St. Mark Parish, received all Sacraments at Saint Mark including Marriage,. Graduated St. Mark School, class of 1967. Attended Nazareth High School, class of1971. Attended Pace University.